20 • RV PRO • September 2018 rv-pro.com Keystone's Raptor/Carbon Raptor's exterior has been completely redesigned for 2019 to appeal to younger and more active buyers, says Nick Eben- roth, product manager. The line will feature a rich charcoal gray with monochromatic highlights of silver, black and white. The other big Raptor exterior news is that the brand is introducing four front windshield models to bring more natural light into those floorplans. Raptor also will introduce additional white cabinetry for 2019, following its successful introduction last year of two- toned cabinets (white uppers and dark brown lowers). 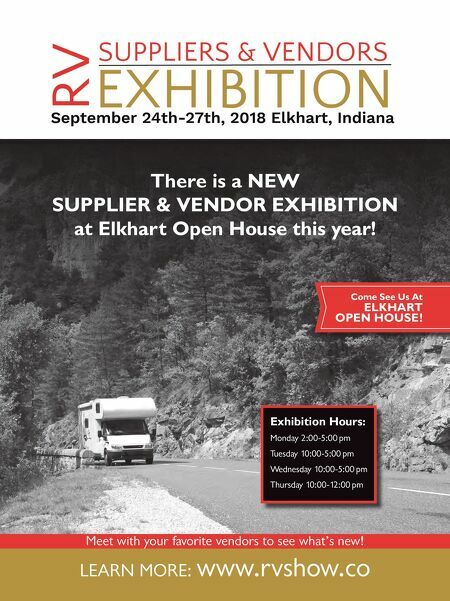 CrossRoads RV CrossRoads RV will show 46 new or redesigned floorplans at Open House, according to company President Ryan Juday. "We thought we took a lot (35) last year. This trumps last year's Open House," Juday says. 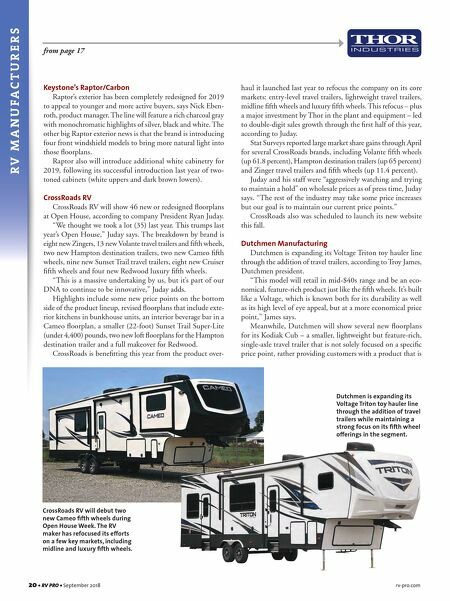 The breakdown by brand is eight new Zingers, 13 new Volante travel trailers and fifth wheels, two new Hampton destination trailers, two new Cameo fifth wheels, nine new Sunset Trail travel trailers, eight new Cruiser fifth wheels and four new Redwood luxury fifth wheels. "This is a massive undertaking by us, but it's part of our DNA to continue to be innovative," Juday adds. Highlights include some new price points on the bottom side of the product lineup, revised floorplans that include exte- rior kitchens in bunkhouse units, an interior beverage bar in a Cameo floorplan, a smaller (22-foot) Sunset Trail Super-Lite (under 4,400) pounds, two new loft floorplans for the Hampton destination trailer and a full makeover for Redwood. CrossRoads is benefitting this year from the product over- haul it launched last year to refocus the company on its core markets: entry-level travel trailers, lightweight travel trailers, midline fifth wheels and luxury fifth wheels. This refocus – plus a major investment by Thor in the plant and equipment – led to double-digit sales growth through the first half of this year, according to Juday. Stat Surveys reported large market share gains through April for several CrossRoads brands, including Volante fifth wheels (up 61.8 percent), Hampton destination trailers (up 65 percent) and Zinger travel trailers and fifth wheels (up 11.4 percent). Juday and his staff were "aggressively watching and trying to maintain a hold" on wholesale prices as of press time, Juday says. "The rest of the industry may take some price increases but our goal is to maintain our current price points." CrossRoads also was scheduled to launch its new website this fall. Dutchmen Manufacturing Dutchmen is expanding its Voltage Triton toy hauler line through the addition of travel trailers, according to Troy James, Dutchmen president. "This model will retail in mid-$40s range and be an eco- nomical, feature-rich product just like the fifth wheels. It's built like a Voltage, which is known both for its durability as well as its high level of eye appeal, but at a more economical price point," James says. Meanwhile, Dutchmen will show several new floorplans for its Kodiak Cub – a smaller, lightweight but feature-rich, single-axle travel trailer that is not solely focused on a specific price point, rather providing customers with a product that is R V M A N U F A C T U R E R S from page 17 CrossRoads RV will debut two new Cameo fifth wheels during Open House Week. The RV maker has refocused its efforts on a few key markets, including midline and luxury fifth wheels. Dutchmen is expanding its Voltage Triton toy hauler line through the addition of travel trailers while maintaining a strong focus on its fifth wheel offerings in the segment.